At the Department of Transportation’s training facility in Newington massive sheets of paper are taped to the walls and lined with blue painter’s tape and dotted with multi-colored post-it notes and cut-out paper stars. In the room are perhaps ten employees with the Office of Early Childhood Development. There is a table with snacks of Goldfish crackers and bottled water. This is a Kaizen training session, part of Connecticut’s LeanCT program aimed at making government more efficient. Lean Program Management began in the United States in the 1980’s in an attempt to mimic Toyota’s successful business model. The aim is to create “customer value” while eliminating waste. Groups from three different state agencies work in different rooms with a leader from Leanovations, LLC, a company hired by the state to train employees in the Lean Management program. Each department that undergoes Lean training evaluates a single process within the agency at a time, so as not to be overwhelmed. Instead the program takes small bites out of the bureaucracy over time. 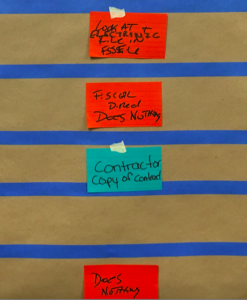 The post-it notes on the papered wall are meant to show the various steps in a process. In this case the OECD was looking at the process of receiving, approving and filing contracts and financial statements from various nonprofit agencies. The idea is that by laying out all the various obstacles that have been built into the bureaucracy over the years, the employees will find ways to cut out what isn’t needed. “No one wants to be a red ticket,” says Michael Bright, a DOT employee and a LeanCT trainer. By working with the Lean program, the OECD employees estimate they can cut the time it takes to file contracts and financial reports from nonprofits from 2-6 weeks down to 1-2 weeks. The DOT employees in another room estimate that they will be able to cut the time it takes to approve out-of-state travel expenses from 37 days down to 16. The training also brought in the nonprofit contractors to meet with the OECD employees to get their input as to how processes can be streamlined. Leanovations, LLC is one of five companies hired to help put Connecticut on the Lean track and received $138,800 in FY 2015 for its services. State agencies are allowed to pick and choose which company they want to work whose expertise best suits their needs. The training itself is peppered with buzz-words and phrases; “garbage in, garbage out,” “don’t reinvent the wheel,” and “teamwork, training and technology.” The state employees seemed enthusiastic at being able to cut through some of the red-tape that often makes their jobs more difficult. As technology has improved, government has often not kept up. Some of the solution ideas in the Kaizen training session involved replacing hand-written signatures with electronic signatures. Agencies are supposed to streamline the process before adding new software or technology to the mix otherwise IT merely replicates the process problems. Although this program may represent a step in the right direction, it also comes on the heels of previous attempts to cut waste from government with pop-culture business strategies. As recently as 2004, Connecticut was engaged in Total Quality Managment and Quality Assurance. 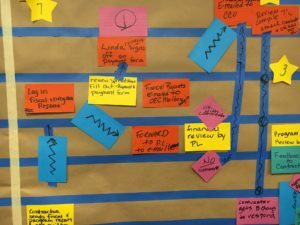 TQM eventually was replaced by Lean Management across the business world and in the state of Connecticut.